It’s official, the world is coming to an end. No, not a no-deal Brexit, but rampaging climate change. According to the United Nations (band of thieves and vagabonds) we have 12 years to save the world as we know it. Meeting: My decision to vote against the committee caused outrage. This view is reinforced by a conference held in Poland, which stated that a 1.5 degree rise in global temperature would result, according to one Calderdale councillor, in ‘war and chaos’. 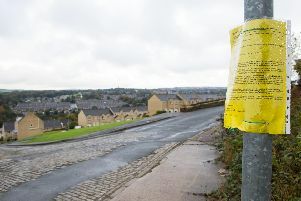 Well let’s not panic, we’ll set up a ‘Calderdale Climate Emergency Committee’, talk to the West Yorkshire Combined Authority, the Local Enterprise Partnership and ask the Government for some resources (that means money, not a writing pad and a few pens). Sorted! This was the debate we had at full council. Man-made climate change is now the new religion of the socio-lefties, no gainsaying or dissenting voices are allowed. Any mention of climate change sceptics, Donald Trump is famously one, results in behind the hand giggling and patronising sniggers. It’s this kind of ‘I know better than you’ attitude that is driving the whole political debate in this country at the moment. Of course, council voted to set up this pointless talking shop (more hot air, which I’d have thought the believers would be trying to avoid). The Liberals and Labour were in favour but the Conservatives, although they spoke against the proposal, bravely abstained en bloc. As always, it’s about votes not principles. Hopeless. My vote against the formation of this committee created a furious response from the climate change activists in the public gallery of the Town Hall chamber. One of them, after asking for my personal details in the manner of a pre-apartheid South African policeman asking a coloured person for his papers, promised to get me deselected (good luck with that). Another assured me I would never stand in or win another election (how does that work? ), but most disturbingly a young man, who was closer to me than most men have ever been, said I was responsible for murdering his, as yet unborn, children and grandchildren. I’m afraid this is the tenor of the debate in our society at the moment. While I’m having a moan. As I was driving home after a recent Ward Forum, where we had discussed inconsiderate parking and littering, I was stopped, waiting for the lights to change when the passenger in a white Mercedes with blacked out windows in front of me threw out three fast food drink containers. As we crawled past Tesco it became clear that the traffic was held up by two 40 foot delivery lorries parked on yellow lines, effectively making the A58 a one-way street. I felt like banging my head on the dashboard.